Whoowasit? 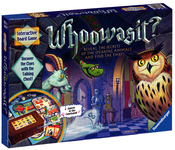 - Reveal the secrets of the talking animals and find the thief. A magical chess contains intelligent electronics that ensure the game is different and exciting every time. Mystery Garden - The "Guess What I See" game. Enter Mystery Garden with all of its fascinating scenery and various magical inhabitants. Sherlock Deluxe - The card game where memory and deduction are "Elementary"! Race To The Roof - Get ready for this exciting game of pursuit where no two games are alike. Can you make it to the attic before anyone else? Parents' Choice Gold Award. For these and other fun and exciting strategy games, family games, and puzzles come and visit us at at Off The Charts Games! We are located at 30 NW 2nd Street, in Downtown Gresham. We proudly serve the Gresham, and the greater Portland and Vancouver areas.